Anzeige/Ad: Sportswear, athleisure, streetwear– how ever you want to call it. Sometimes it just has to be comfortable. I always like to be stylish and fashionable, yet like to feel cozy and relaxed. I’ve been swapping jeans for track pants a lot lately and feel very appropriate and confident with it. Comfort has definitely become priority and we should all embrace the athleisure style a bit more often. The typical Alexander Wang look is often described as the laid-back model- off-duty look. Starting with a small collection of knitwear in 2005, Alexander Wang has developed into every It girl’s go to designer. The style is sporty and relaxed with a cool grunge tendency. Combining basic wardrobe staples with outstanding statement pieces, innovative shapes and fits. The perfect interpretation of an effortlessly cool New York style. Exactly what I like. These Alexander Wang balloon track pants are somewhere between leisurewear and athletic. They are a cool statement and extremely versatile. They are ideal for a cozy off-duty look, but also perfectly work with heels for a sophisticated outfit. I love the high-waisted and loose fit and the elastic ankle cuffs. The balloon shape is super fashionable and cool. They have an elastic drawstring waist to create a beautiful defined waistline and side slit pockets. I’m in love with the reflective silver color. Sometimes y0u have to set a statement. I decided to go for a total Alexander Wang look and opted for this bright yellow sweatshirt. It is perfect to freshen up your dark winter wardrobe. 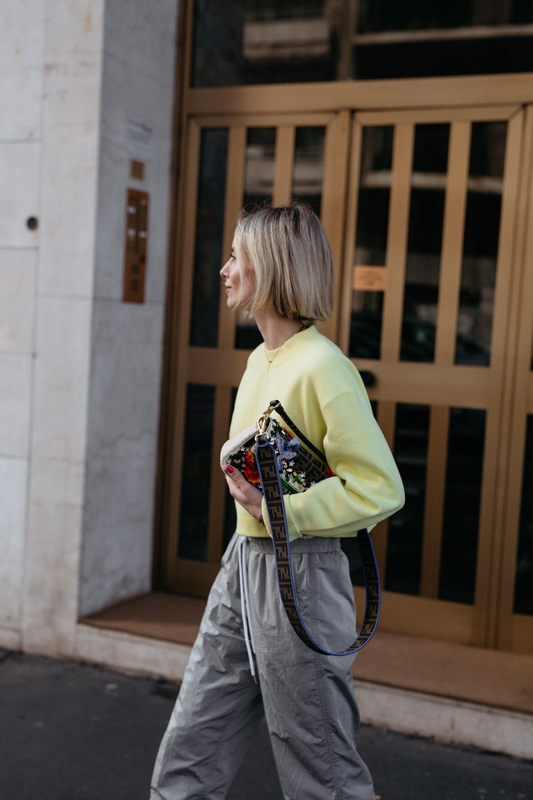 Spring is just around the corner and I already told you in a previous blogpost here, that yellow will clearly be one of the biggest fashion trends for spring 2019. I am starting to really love yellow and I’m pleasantly surprised of how it instantly upgrades any kind of outfit without looking over the top. The cropped and oversized style of this Alexander Wang sweater perfectly fits with the high waisted pants and creates an interesting silhouette. It is made from super soft cotton. It has a crew neck, dropped shoulders and a small embroidered logo at the chest. Most of the time less is definitely more, sometimes however you just need to add that extra bit of sparkle to your outfit. While I have kept my outfit super simple and sporty, I really wanted to splash out with my bag. I’m so in love with the Fendi baguette bag. I already told you that the iconic baguette shaped handbags are celebrating a huge comeback this season and are a homage to the designs from the late 90’s. My new multicolor baguette bag is the perfect eye-catcher. It is made of the signature FF jacquard fabric and is playfully decorated with beautiful embroidery and colorful sequins. White booties are definitely one other must-have for spring. I already wore these beautiful Miu Miu heels in my blogpost here. They are super comfortable and round off every kind of outfit. As you guys now, I love clashing styles. I just had to wear heels with this sporty look.